Two and half years on from the invitation to local councils and business leaders to form Local Enterprise Partnerships (LEPs) in England we have now reached a critical juncture in their development. The 39 sets of local actors across England have been busy building these new institutions and forging and nurturing partnerships since 2010. In the wake of Lord Heseltine’s review In Pursuit of Growth in late 2012 and its central call for more decentralisation of resources and responsibilities to LEPs, Government is shortly to announce its response in next week’s Budget. Researchers in CURDS have undertaken the first national survey of all 39 LEPs as part of their involvement in the national Spatial Economics Research Centre (SERC) and the study sought to take stock of the current position and prospects for the LEPs. In early March 2012, CURDS hosted a seminar on ‘The State of the LEPs‘ to disseminate the preliminary findings and to engage in discussion about the issues with academics, analysts and policymakers from across England. This fundamental question prompted some reflection on the specific nature and purpose of LEPs. For some in the CURDS research, the LEP constituted the Board while for others it was the locus of the local partnership for economic growth. Clarity on the aim, purpose and role of the LEPs remained a central issue on which LEPs were developing their own local views and they are were increasingly keen to better understand what Government has in mind for the longer term. Are LEPs too small and fragmented really to add value and make a difference to local growth? The size and scale of the LEPs and the fragmented character of the institutional arrangements was a very real concern to local and national economic development actors. Unflattering comparison was drawn with European and other regions whose more substantial and “heavy-weight” institutions and resources for regional and local economic development left the LEPs looking rather limited and under-powered in the competition for the investment, jobs and innovation to generate local growth. The CURDS research revealed a diverse picture of varied capacity and resources amongst the LEPs. Establishing the staff and finances of the LEPs is complex. Staff contributions are direct, indirect and pro bono and in-kind from partner organisations. Finances comprise a range of funding streams – European, central and local – with some allocated and some won in competition. Direct staffing ranged from up to 40 to less than 1. Finances stretched from an estimated £40m to under £5m. In this kind of resource environment, it rang very true that for local economic growth the “LEPs were only as strong as their partners”. How can central Government provide the advice and guidance on what the longer-term vision and plan is for LEPs in ways that don’t challenge the idea of ‘localism’ and undermine the autonomy local actors? This issue is especially thorny. The CURDS research found that LEPs were crying out for a sense of where Government policy is heading and what further responsibilities and resources are coming over the horizon. Yet mixed and unclear messages were emerging from different Ministers and Departments. LEPs want a steer and direction – rather than prescription – on where Government would like to see institutional arrangements to facilitate local growth heading. Are LEPs competitors and/or collaborators? While the 39 LEPs were – in numerous cases – bottom-up entities, the CURDS research and discussion at the seminar focused on the issue of how the LEPs relate to each other within the broader network or system. There is evidence of chasing investments, firms and people for individual LEP areas. There are examples too of collaboration on issues of shared concern, whether with neighbouring LEPs or those further afield for example on MoD and the defence estate. Given the national centralisation of key policy areas important to local growth in inward investment and innovation, the CURDS research revealed an uneven set of relationships between specific LEPs and the key national institutions. In a competitive model, the more capable and better connected LEPs will forge ahead leaving others in their wake. In a collaborative model, the benefits of knowledge exchange and learning might be spread out across LEP-land. If rebalancing is still a serious government concern then some thought on how the overall system inter-relates and works would be timely. How can LEPs maintain their streamlined organisations with growing responsibilities and resources to manage? The fear articulated here was about “bureaucratisation” and losing the agile and focused ways in which LEPs are trying to do more with less. Balancing this concern was the need to be accountable for the decision-making and disbursement of public funds. Indeed, the CURDS research revealed many LEPs were uneasy and seeking advice on appropriate governance arrangements to address these concerns and assuage the anxieties of private sector board members. Engaging the private sector by giving them a real say was seen by LEPs as critical to sustaining their meaningful input. But how can it be done in ways that are accountable and transparent? How much decentralisation and for whom? In the wake of Lord Heseltine’s review, further decentralisation of responsibilities and resources are expected to be heading the way of the LEPs. Local actors expressed concerns about exactly how this would work. Would there be decentralisation in waves? Would an initial tier of more capable and strong LEPs with recognised economic opportunity and potential to contribute to local growth emerge at the front of the queue for further resources and responsibilities? Where this left the less capable and weaker LEPs was less clear. Even given the history of flux in the governance arrangements for economic development in England and the alphabet soup of acronyms of the institutions of previous eras, it was felt that LEPs were likely be around for a while with little prospect of further change whatever the outcome of the General Election in 2015. Amongst the local actors there was little appetite for further institutional change and upheaval, the costs of which were still being felt by many in the wake of the dismantling of the regional tier. Fundamentally, local actors were trying to get on with the job of growing prosperity locally. “LEPs may come and go but the rationale for the local partnerships remain” as one participant put it. As the LEPs await the announcements in next week’s Budget, rumination centred upon whether or not a collective voice for the “LEP family” could or should emerge. Two and half years in LEPs have been largely reactive to the changing landscape of economic development governance policy emanating from the centre. In the next two and half years, LEPs might decide that their shared concerns and interests would be better articulated in a collective and proactive way. This is especially the case if the current government’s predilection for the ‘deal-making’ of “asks” and “offers” continues to shape centre-local relations in England. You can also view the slides from the seminar. Whither the local and regional role of universities? The Lord Dearing Lifetime Achievement Award prompted me to look back to his 1997 report and reflect on where the sector is now in terms of one of his chapters- the local and regional role of HE. As evidence to the Dearing review, the CVCP (the precursor to UUK) asked the Centre for Urban and Regional Development Studies at Newcastle University to undertake a review entitled ‘Universities and Communities’ based on submissions we received from most universities. Drawing on this and other evidence Dearing noted that “HE is now a significant force in regional economies as a source of income and employment, a contribution to cultural life and in supporting regional and local economic development… As part of the compact we envisage between HE and society each institution should be clear about its mission in relation to local communities and regions”. Dearing clearly recognised that this ‘compact’ was wide ranging, had a strong local dimension and was one where the university’s contribution to ‘the economy’ could not be separated from the wider society in which it is embedded. Some of what Dearing recommended has to come to pass in the ensuing decade. Universities came to play a key role in the regional governance architecture of England. Through regional associations universities from different mission groups worked together with RDA and HEFCE support to respond to regional needs and opportunities – for example combined efforts through Aim Higher to deliver widening participation in HE. Joint working not only with RDAs but other public bodies like regional local authority associations and the regional Arts Councils recognised mutual interests and the fact that the regional impact of universities was maximised when the knowledge supply and demand sides were operating in tandem across a broad front. Much of this regional architecture, including most of the regional associations of universities, has now been dismantled to be replaced by a new emphasis on localism and a singular focus on the contribution of universities to the economy nationally and locally. For example HEFCE has just invited bids to its Catalyst Fund for projects “to enhance the economic anchor role of universities and colleges within their localities”. Most universities in England are located in a city. In our new book The University and the City, Paul Vallance and I demonstrate that universities are much more than economic actors. Location in cities means that universities must perforce have relationships with other institutions that inhabit the city and play a role in its physical, social and well as cultural development. Urban location also raises normative questions for academic practise – how to be of relevance to the place in which the practitioners live and work as citizens. The public good question frequently raised by Chris Brink, Vice Chancellor of Newcastle University of not only what are universities ‘good at’ in terms of research and teaching but also what are they ‘good for’ has real resonance at the city level. In response to this question, we see individual academics and whole institutions like UCL and Newcastle viewing the city as a ‘living laboratory’ as they respond to such global challenges as sustainable development, an ageing population and inter-cultural interaction, challenges which also have a local dimension. Significantly these grand challenges also provide business opportunities – for example in the development of technologies and services delivery innovations to enable older people to remain in their homes. To what extent will the deep and broad relationships that we observe have been built-up between universities and their cities survive the turbulent times and era of public austerity confronting both cities and universities? Will universities and local authorities pull up the drawbridge and concentrate only on their core teaching and research functions or statutory responsibilities? We argue that there are strong incentives for universities to strengthen partnerships with local civil society in order to deliver widening participation, to enhance the student experience and employment outcomes and to demonstrate the impact of research. Likewise local authorities and Local Enterprise Partnerships with tight budgets will need to look to universities in their area as key actors able to connect the global and the local across a broad front. Indeed, those universities like my own that fulfil this civic role will be truly anchor institutions in the broadest sense of the word. 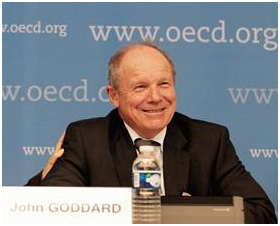 John Goddard is Emeritus Professor of Regional Development Studies and formerly Deputy VC at Newcastle University. 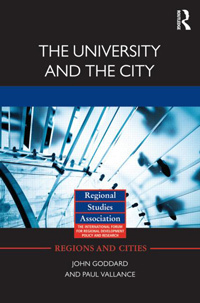 His book with Paul Vallance on The University and the City was published by Routledge on 31st January.